Simplicity goes hand-in-hand with function when it comes to midcentury basics. The walls and floor are a good indicator of this. How much of the walls and floor can you see? Take a close look at the Medeiros’ living room—no floral-patterned rugs inhibit the floor, and the wall hangings stay simple and clean. This doesn’t mean that you can’t display knickknacks and small accessories. Just keep them confined to their own areas and don’t crowd too many objects at once. If you have space in a bookshelf to display a few vases, highlight them by including one object in each space, instead of trying jam in multiple pieces. While midcentury style stresses simplicity and a lack of clutter, it doesn’t downplay color. 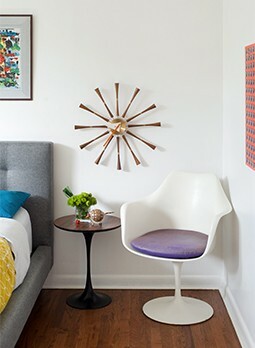 Add bright pops of vibrant hues with a bright orange sling chair or lime green sota chair. If you want to stay neutral with your major furniture pieces, paint an accent wall in a bright shade, or add color through smaller accents such as a TV stand or sheets on your bed. Just remember that simplicity trumps color—so only add pieces if they’ll contribute to your overall MCM aesthetic.